When I'm looking at the overview (Dash + open windows) the background 'wash' or 'tint' that covers the desktop wallpaper is a very dark black colour that, to my eyes, grates against the very bright white thumbnails of the applications you have open. 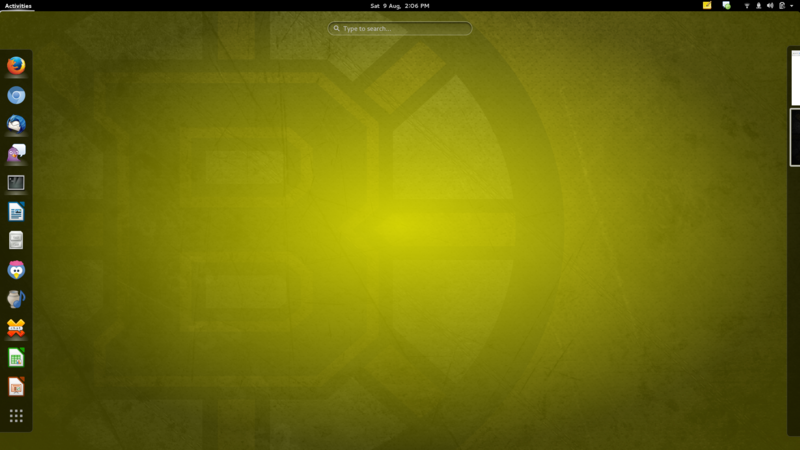 Or sometimes the black overlay just doesn't look great with your wallpaper or application/dash icons. Is there any way to make the wallpaper say, blurred instead of having a black tint over it? Or tint it with another colour? I've tried elegance-colors and gnome-tweak-tool, but neither of them seem to have this option. The former has extensive 'chameleon colour' options for GNOME except (I think) for the overview background tint. The gnome-tweak-tool doesn't have it as far as I can see either. Maybe post this question at the GNOME forums? I think it'll get answered more quickly there. I'm not sure, but probably the only option is to use some of gnome shell themes, or change the default theme manually. I've tried lots of shell themes and they seemed to change everything but the black/dark wash of the overview. Any idea how I might go about manually editing it? I happened to be in the same place as several of the core GNOME developers today, so I asked one of them about this, and he said that this specific behavior (the lightbox effect in the overview) was handled differently depending on which gnome-shell release you're running. I happened to be running 3.12 (from this copr repo, so he explained how it works in 3.12 and 3.14. "cogl_color_out.rgb = cogl_color_out.rgb * pixel_brightness * brightness;\n"
-"cogl_color_out.rgb = cogl_color_out.rgb * pixel_brightness * brightness;\n"
+"cogl_color_out.rgb = mix(cogl_color_out.rgb, constant_color, pixel_brightness * brightness);\n"
* allow different rendering options to be set for different copies. I asked about the reprocussions of changing this behavior in mutter, and he was reasonably confident that nothing else besides the shell overview mode was using this code in mutter. He also said that there were plans in the near term to rewrite how this code works entirely, but that he thought a patch to add a CSS option to enable the color choice for the overview lightbox would be accepted. The same fix may apply to 3.10 mutter, but I do not have an instance of Fedora running 3.10 handy at the moment, and he seemed to think it might not work exactly the same there.